Delicious makhani cooking sauce is made with makhan (Indian butter), tomatoes and aromatic spices to give both creamy texture and tangy flavour to this lamb curry. 1. In a large saucepan, heat the oil and gently cook the onion for 3–4 minutes. Add the lamb and fry for a further 2–3 minutes, stirring, until just beginning to colour. 2. Add the makhani cooking sauce, sweet potato and 300ml water. Bring to the boil then simmer, uncovered, for 30 minutes, stirring occasionally until the lamb and sweet potato are tender. Towards the end of cooking, warm the naan bread according to the pack instructions. 3. 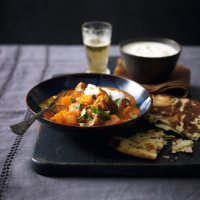 Serve the curry scattered with some coriander, a swirl of yogurt, and the warm naan bread. To cut through the rich fruity flavour, add a teaspoon of Waitrose Lime Pickle just before serving. White wine is the perfect pairing with these flavours. Pick a bottle from our selection of white wine.